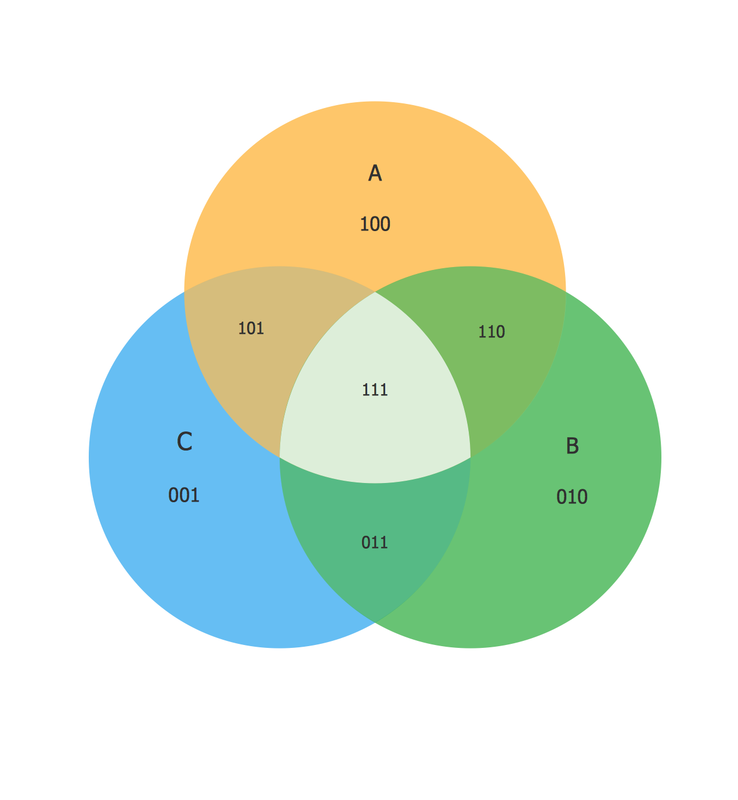 Create your Venn diagrams for logic problem solving using the ConceptDraw DIAGRAM diagramming and vector drawing software extended with the Venn Diagrams solution from the area "Diagrams" of ConceptDraw Solution Park. "Venn diagram ... representing some sets by contours of closed shapes, such as circles or ellipses (and sometimes also the universal set as a rectangle enclosing all of these shapes), and indicating the relationships between the sets: by overlapping the shapes to show that the corresponding sets have a non-empty intersection, and by possibly (but not necessarily) enclosing all of the sets (which are proper subsets of the universal set) within a universal set (represented typically by a rectangle); such that the total number of simply connected regions is 2^n, where n is the number of depicted sets which are proper subsets of the universal set." Example 1. Venn diagram as a truth table. "A truth table is a mathematical table used in logic—specifically in connection with Boolean algebra, boolean functions, and propositional calculus—to compute the functional values of logical expressions on each of their functional arguments, that is, on each combination of values taken by their logical variables (Enderton, 2001). In particular, truth tables can be used to tell whether a propositional expression is true for all legitimate input values, that is, logically valid." The Venn diagram example above was redesigned from the Wikipedia file: Venn3tab.svg. This template shows the Venn Diagram. It was created in ConceptDraw DIAGRAM v12 diagramming and vector drawing software using the ready-to-use objects from the Venn Diagrams Solution from the "What is a Diagram" area of ConceptDraw Solution Park.